The US is trying to spare a jihadist group in its attempts to unseat Syria’s President Bashar al-Assad, Russia’s foreign minister has told the BBC. 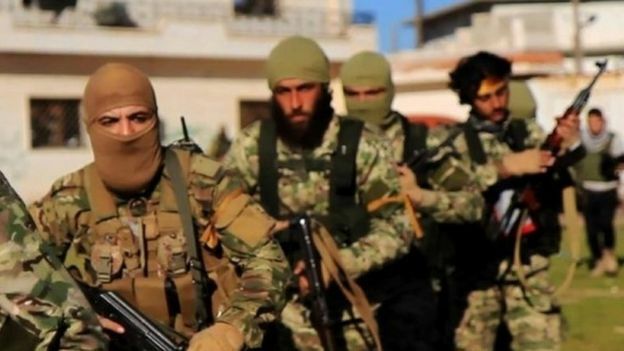 Sergei Lavrov said the US had broken its promise to separate the powerful Jabhat Fateh al-Sham (formerly known as al-Nusra Front) and other extremist groups from more moderate rebels. And he defended the bombardment of Aleppo by Russian and Syrian forces. Jabhat Fateh al-Sham is linked to al-Qaeda. Mr Lavrov was speaking to Stephen Sackur on BBC World News TV on the first anniversary of the beginning of the Russian air campaign in Syria. “They [the US] pledged solemnly to take as a priority an obligation to separate the opposition from Nusra,” he said. Watch the BBC interview in full. Mr Lavrov says that it is US policy towards Syria that is floundering, insisting that American officials have lost control of both events and of themselves. There is an element of truth here – at least in policy terms. The US has no real alternative to Secretary of State John Kerry’s efforts to deal with the Russians. There is no credible “plan B”. 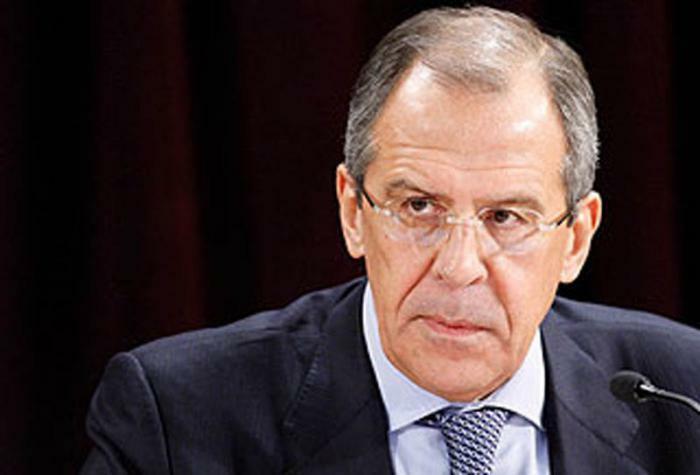 Mr Lavrov’s central message – that Washington has refused to press its allies to separate themselves from the Islamists of al-Nusra ignores the fact that it is Russia’s air campaign that is pushing rebel groups into al-Nusra’s arms. Mr Lavrov’s contention that the US is preserving al-Nusra, hoping eventually to use it to change the regime, will prompt gasps of condemnation in Washington. But Mr Lavrov implicitly highlights a perennial difficulty for Washington – its search for a moderate opposition of sufficient critical mass to influence the battlefield. A recent US-Russian deal was meant to lead to joint Russian-US air strikes on the Islamic State group and Jabhat Fateh al-Sham. But many of the more moderate rebel groups that the US backs have formed a strategic alliance with the more powerful Jabhat Fateh al-Sham and now fight alongside it. 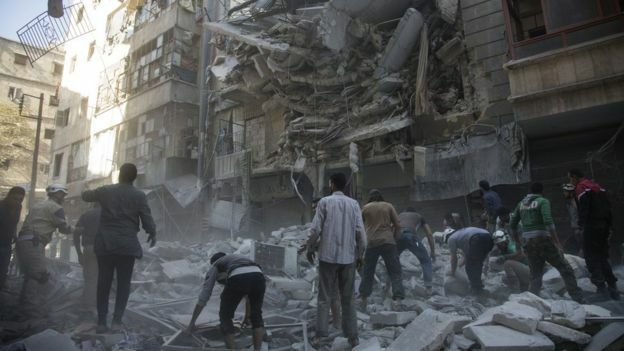 The United Nations says 400 civilians, including many children, have been killed in the besieged city of Aleppo during the past week as a result of bombardment by Russian and Syrian government forces. Mr Lavrov insisted Russia was helping President Assad’s forces to “fight terrorists”. And he accused the West of staying quiet about civilian suffering in Aleppo when it was expecting the city to fall to the rebels after the Nusra group moved in and cut supply lines to the civilian population. “We had many pauses, many humanitarian pauses during this year… 48 hours, 72 hours at the request of the United Nations. “Every time these pauses have been used by Nusra to get from abroad more fighters, more ammunition and more weapons. There must be some first step and we have to get our priorities right. But he insisted there had been no “meaningful proof” of this and there was a need to investigate every case. “We are not using any munition which is prohibited by the United Nations,” he added. Friday saw Syrian government forces and rebels fighting in the centre of Aleppo and north of the city, a week into the Russian-backed offensive by the Syrian army to take the city and surrounding area. The Syrian Observatory for Human Rights monitoring group and a Syrian military official said government forces had captured territory north of Aleppo and buildings in the city centre, but rebel sources denied this.